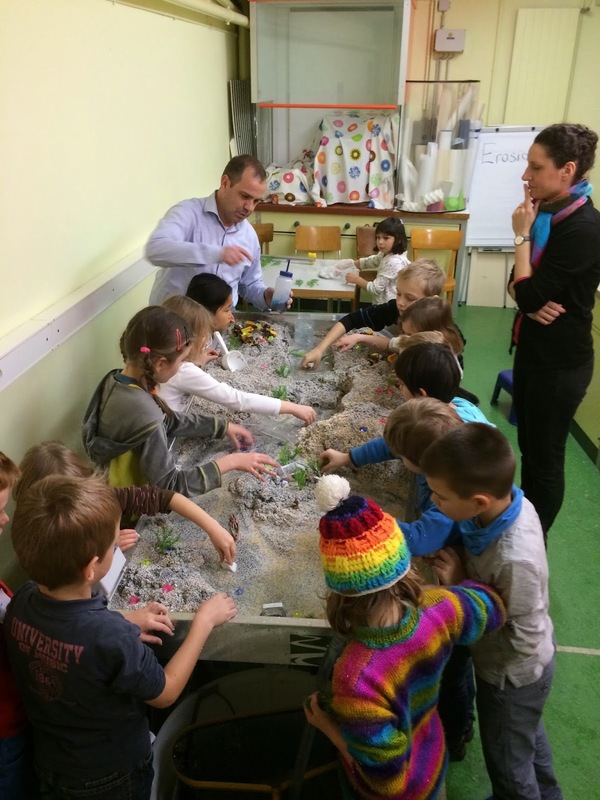 Dr. Nikolaus Kuhn and Debora Haller work with students at the Kid's Lab. Photo by Brigitte Kuhn. The University of Basel’s Kids’ Lab illustrates the world of natural science to children between 6 and 12 years of age by engaging them in hands-on exploration. Debora Haller is the head of the Kids' Lab. The Physical Geography and Environmental Change Research Group of the University of Basel supports the lab, including Dr. Nikolaus Kuhn, Dr. Wolfgang Fister and Brigitte Kuhn. 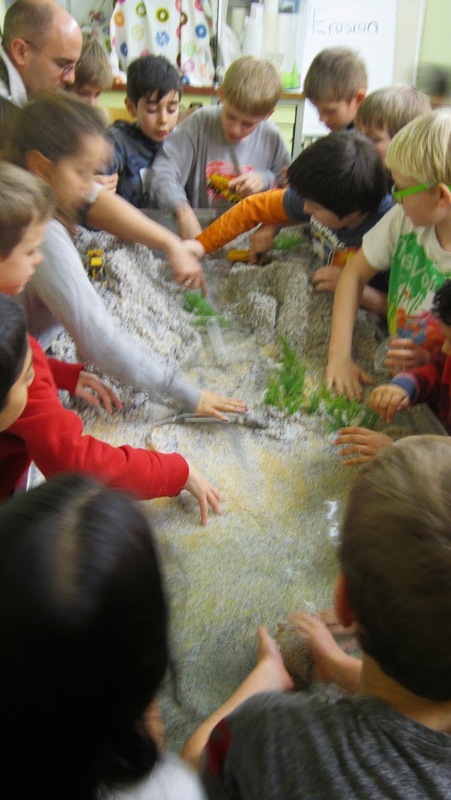 The students were asked at the starting point of a recent session using the Emriver Em2 geomodel how a gorge like the Grand Canyon can form. The children were free to hypothesize, and soon they found out the answer by running an experiment in the Em2. First they helped fill up the Em2 with its granulate material—color-coded-by-size modeling media made of melamine plastic—which got them physically involved. 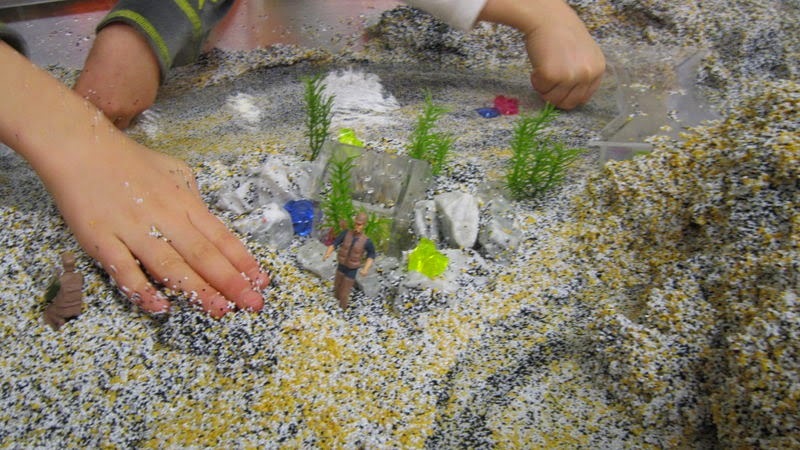 With the guidance of an expert scientist, they built a plateau and then let the water run through. They were asked to observe different processes visible, such as infiltration, seepage, erosion and deposition and to put their observations into words, which involved them mentally. Once the canyon had formed, they documented the sequence of erosion on a worksheet to record their findings. A model house in the Emriver Em2 geomodel. Photo by Debora Haller/Brigitte Kuhn. Following the structured part of the lab, the more fun part followed. In groups the children had the task to save a model house placed at the riverbank from being swept away by flood water. They figured out solutions themselves or with the assistance of the instructors, such as supporting the bank with boulders and trees. The children had their hands and minds engaged in this sensory learning experience. Little side-experiments were carried out—for example islands were heaped up, only to discover the river constantly sweeps the sediment away again. That brought up the subject of artificial islands, like Palm Islands built in the Persian Gulf, and what problems might turn up there. 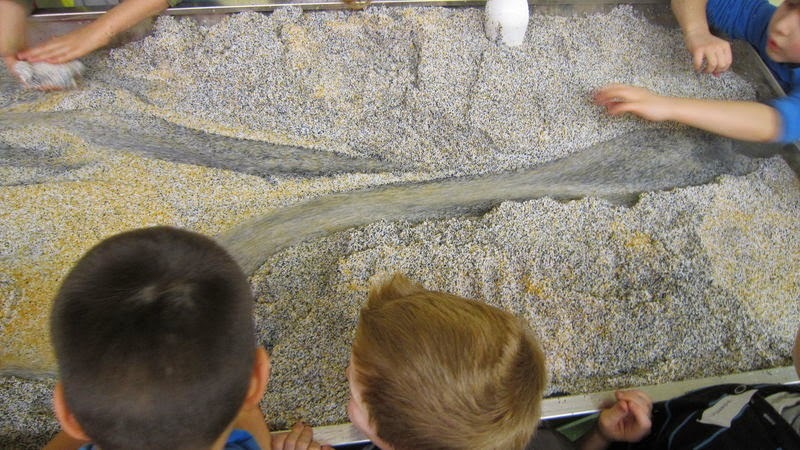 Overall, geological processes became visible, tangible and fun, even for the smallest kids in this session of the Kids’ Lab. Students experiment with the Em2. Photo by Debora Haller/Brigitte Kuhn. It is wonderful to see a university who is doing sophisticated research with an Em2 and Emflume1 also use the Em2 to educate young students—our researchers of the future. Dr. Wolfgang Fister teaches students at the Kids' Lab. Photo by Debora Haller/Brigitte Kuhn.